ATLANTA, July 20, 2018 – Nine days of world class tennis will begin on Saturday morning at Atlantic Station as the 2018 BB&T Atlanta Open starts play with eight singles qualifying matches. The four players who win two qualifying matches will earn a spot into the BB&T Atlanta Open singles main draw. One of the featured players will be Kiranpal Pannu, a player at Columbus State, who won the BB&T Atlanta Open Wildcard Playoffs on Thursday. Local Atlanta junior and Duke University commit, Garrett Johns, will also be in action on Saturday, playing Alex Bolt of Australia. Former Georgia Tech All-American and local Atlanta product, Chris Eubanks, will be playing Jason Jung. Eubanks reached the quarterfinals of the 2017 BB&T Atlanta Open. 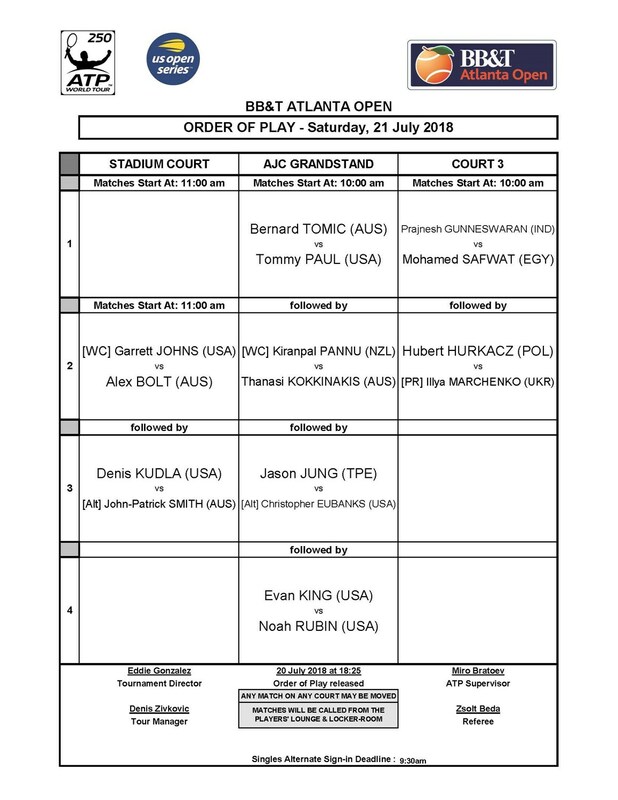 Saturday play begins at 10 am on the AJC Grandstand and Court 3 and 11 am on the Stadium Court.